Anyone who looks at our contemporary life from the perspective of the normal life lived by people in earlier times — say, Russia, or America, or any country of Western Europe in the 19th century — cannot help but be struck by the fact of how abnormal life has become today. The whole concept of authority and obedience, of decency and politeness, of public and private behavior — all have changed drastically, have been turned upside down except in a few isolated pockets of people — usually Christians of some kind — who try to preserve the so-called "old-fashioned" way of life. When such a child becomes an adult, he naturally surrounds himself with the same things he was used to in his childhood: comforts, amusements, and grown-up toys. Life becomes a constant search for "fun" which, by the way, is a word totally unheard of in any other vocabulary; in 19th century Russia they wouldn't have understood what this word meant, or any serious civilization. Life is a constant search for "fun" which is so empty of any serious meaning that a visitor from any 19th-century country, looking at our popular television programs, amusement parks, advertisements, movies, music — at almost any aspect of our popular culture — would think he had stumbled across a land of imbeciles who have lost all contact with normal reality. We don't often take that into consideration, because we are living in this society and we take it for granted. When the "me generation" turns to religion — which has been happening very frequently in the past several decades — it is usually to a "plastic" or fantasy form of religion: a religion of "self-development" (where the self remains the object of worship), of brainwashing and mind-control, of deified gurus and swamis, of a pursuit of UFO's and "extra-terrestrial" beings, of abnormal spiritual states and feelings. 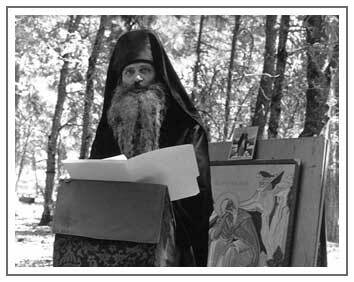 We will not go into all these manifestations there, which are probably familiar enough to most of you, except to discuss a little later how these touch on the Orthodox Christian spiritual life of our days.